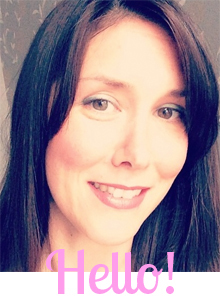 I ♥ Motherhood: Cadbury Easter Egg Trails at a National Trust Property Near You! Cadbury Easter Egg Trails at a National Trust Property Near You! Last Spring we went with friends for our first National Trust Easter Egg trail at Polesdon Lacey. The events are sponsored by Cadbury and they really are such a great family fun day out! Last year I was pregnant with Noah, and Isla was just about old enough to appreciate the trail, and she was definitely old enough to appreciate CHOCOLATE! Our friends brought their little boy Samuel along and they were also expecting their second baby. Isla and Samuel are good buddies and they had a lot of fun that day. We went on the Easter Egg Trail which involved going on a walk through the beautiful grounds of Polesdon and following clues, answering questions and completing challenges to earn a delicious Cadbury's Easter Egg! The weather that day was beautiful and lots of families were also enjoying the day surrounded by the gorgeous Surrey countryside and many made a base for themselves in the grounds and spent the day there picnikking and relaxing. So this year when I was invited to a warm up event for the Easter Egg trails at Morden Hall Park I had to go as I knew that it would be good fun and so I invited my friend and Samuel along too. When we got there we got to have some lovely food and delicious cakes from Hummingbird Bakery - YUM! Once we'd had lunch we went out and let the kids loose on the Easter games and on a chocolate egg trail - Isla was like a sniffer dog for chocolate! There were 'egg-shies' - coconut shies but with eggs, giant snakes and ladders, space hoppers, hoopla and football. The kids had great fun, Samuel loved scoring goals and Isla clung on to her basket of chocolate eggs for dear life. We came away from the event absolutely certain that we definitely want to go on the Easter Egg trail again this year as we could see that the kids would be even more into all the entertainment that is put on for them. 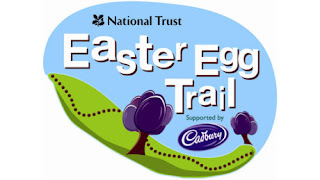 Cadbury Easter Egg Trails run over Easter weekend (6th - 9th April) at 245 National Trust places throughout England, Wales & Northern Ireland. 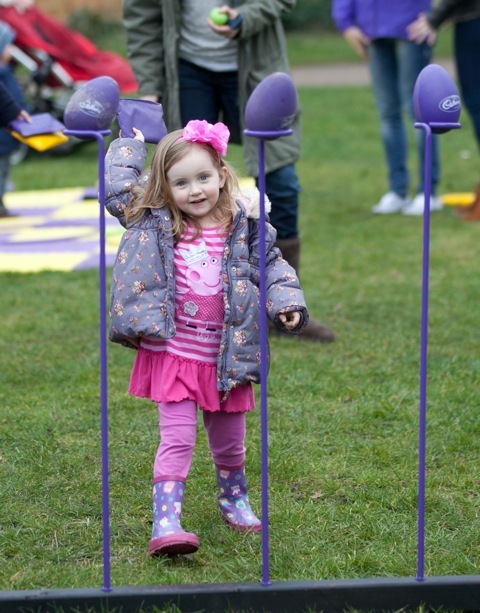 To join in the fun, simply visit www.Eastereggtrails.com where you can find your nearest Cadbury and National Trust Easter Egg trail event and details of how to participate, along with how to make the most of the Easter weekend at home. That looks great. We are going to try and do one in Basingstoke!